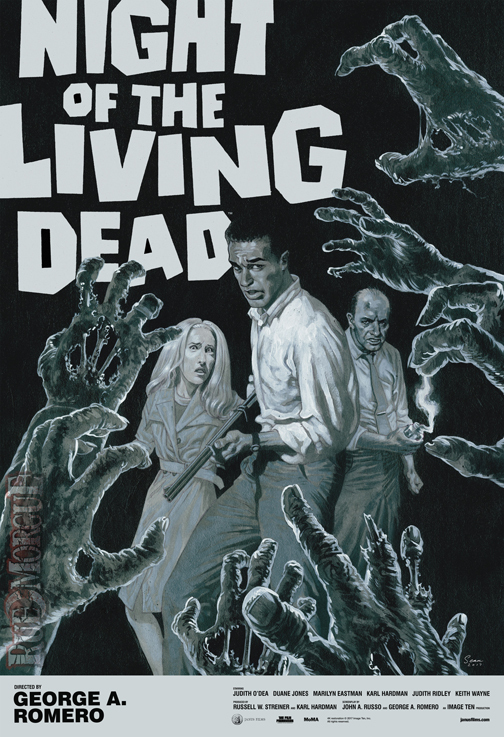 George A. Romero’s landmark NIGHT OF THE LIVING DEAD is stalking back to theaters in a new 4K restoration, beginning its nationwide rollout on Friday the 13th of next month. We’ve got the exclusive first look at the poster. Janus Films is presenting the restoration, which was scanned from the original camera negative and supervised by Romero himself. The influential zombie film will open on October 13 at New York City’s Film Forum, and will have a special Cinespia screening in LA on Saturday, October 21, along with many more bookings in other cities across the U.S. For a complete list of playdates and venues, head over to Janus’ NIGHT OF THE LIVING DEAD webpage.